Straight from the hotel and onto the gravel after only 16 miles of tarmac set the tone for the day. It was then another 29 miles - of gravel - through the beautiful Blackwater forest to the first of three tests planned for the day. Two before lunch and one just after. 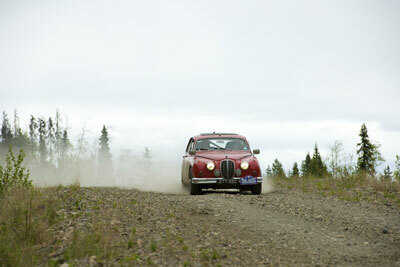 They were all forest road regularities of varying lengths and all set to get the best from the crews and their cars. Throughout the day we passed lakes, creeks and critters and there's an ever increasing sense of wilderness as we drive North and today some crews were lucky enough to see not just one, but a whole family of bears, a pair of eagles and several moose as they progressed though the dense woodland. Crews may have noticed however that many of the trees were diseased and damaged. They've been attacked by the Mountain Pine Beetle, or to give it it's correct name Dendroctonus Ponderosae. Initially the beetles attack weakened trees but once they have a hold in a forest they can, through sheer numbers go for the healthy trees and infest their bark as well. Sadly the problem is spreading slowly to the East and the North of the British Columbia epicentre. There are management techniques but the twin constraints of space and time mean that we can't go into them here. Thanks to the advance car we were able to run all of the sections today without interruption. Yesterday as they drove the route they came across a tree which had crashed down and blocked the road, Andy Actman and Ed' Rutherford bought an axe and with the help of some locals the log jam was cleared and the report sent back to Rally HQ. Lunch and the midday Time Control was at Tony’s Restaurant in Fraser Lake. As usual the cars parked up outside generated a lot of interest and many admiring comments from the locals. In the land where the V8 crewcab pickup is king a two seater open tourer is just too good to miss and some of the 'spectators' called friends to come down so as not to miss the occasion. The 'blogosphere' in this part of the world should be full of classic and vintage machinery tonight. At the lunch halt we also heard that David and Jo Roberts had been held up with yet more trouble for their Triumph TR250. Having already replaced the gearbox, the overdrive and a wheel bearing, today it was the turn of a shock absorber mount to break on the first regularity. David removed it to finish off the mornings sections and had it welded at the lunch halt. They're having a real run of bad luck but their trademark cheerfulness is still in evidence. Anyway, once we'd finished at Tony’s we turned North on the Yellow Head Highway and on to the third and final test which unfortunately had to be cut a bit short because a herd of cows was seen wandering around a bit too close for comfort. We take bovine health and welfare very seriously in this Organisation. At the night halt in Smithers under some massive snowy mountains the car park was busy. As well as the usual daily checks and preventative maintenance Bert Kersten in the no.3 Bentley needed a damaged rim repairing after it sustained some minor damage this morning but he looked happy enough this evening. 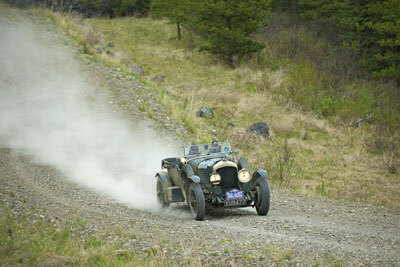 Jan Vorboril, the 2007 Peking - Paris veteran, was seen running his eye over the engine bay of his 1916 Lancia Theta. Car no. 34, the red Mustang was being worked on by the sweep crews, the problem was a slipping power steering belt. It needs replacing but it also needs the tracking to be adjusted. Both jobs for tomorrow morning. For some old hands in the Organisation, Smithers and The Hudson Bay Lodge hotel brings back happy memories. They stayed here on their epic Round the World in 80 days Rally in 2000. Dawson, the road to Chicken and the Yukon will rekindle even more memories. The results published tonight make interesting reading for Gerry Crown who has extended his slender lead to ten seconds ahead of Richard Worts and Nicola Shackleton with Phil Garratt and Kieron Brown still in third place. As usual we've met some fantastic people again today. Interested, helpful and in some cases informative. The woman with fourteen children for example explained that the summers here were short and the winters long and dark. 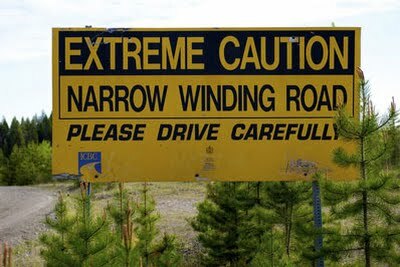 They can be cut off for long periods evidently. Madam we salute you.